Hey Yall! 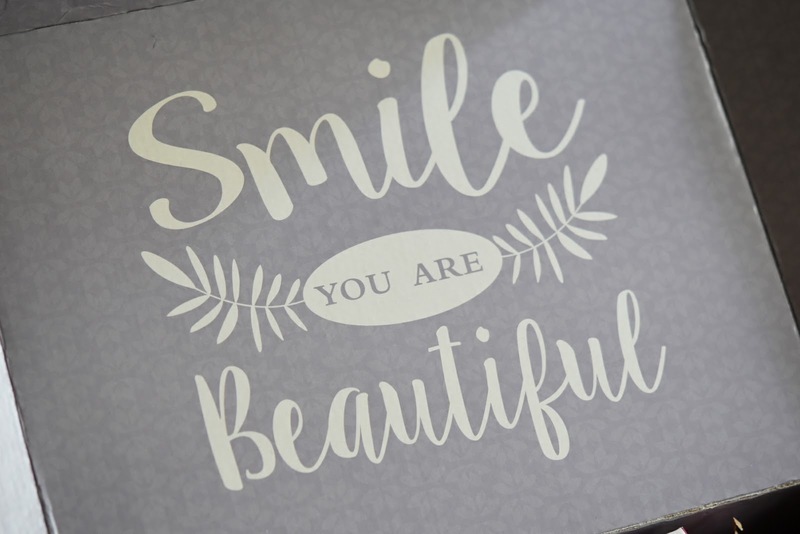 I blog about this brand often because they are freakin' awesome! Every last one of their products has my skin craving for all their natural beauty goodness. If you don't know what I'm talking about, then let me school you about DERMA-E, a natural, ethical skincare brand I've been using for several years now. Even my daughters use their products. I owe DERMA-E major props for keeping my skin ageless, soft, glowing, without any harsh chemicals. And that's why they continue to receive honorable mentions on my blog. 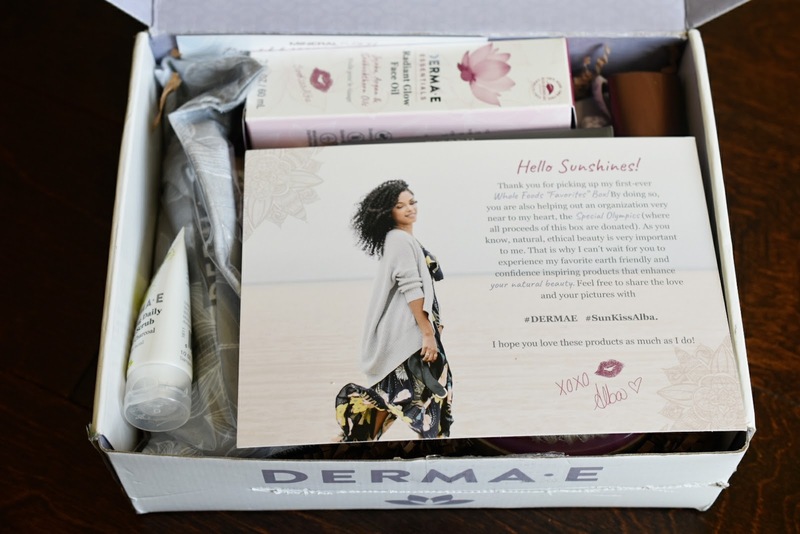 About a couple of weeks ago, while I was doing my usual, attending to my household chores and checking emails (hey, I like to multi-task 😜), I received an email from DERMA-E saying I was one of the lucky chosen ones to be getting an exclusive box they collaborated with SunKissAlba. 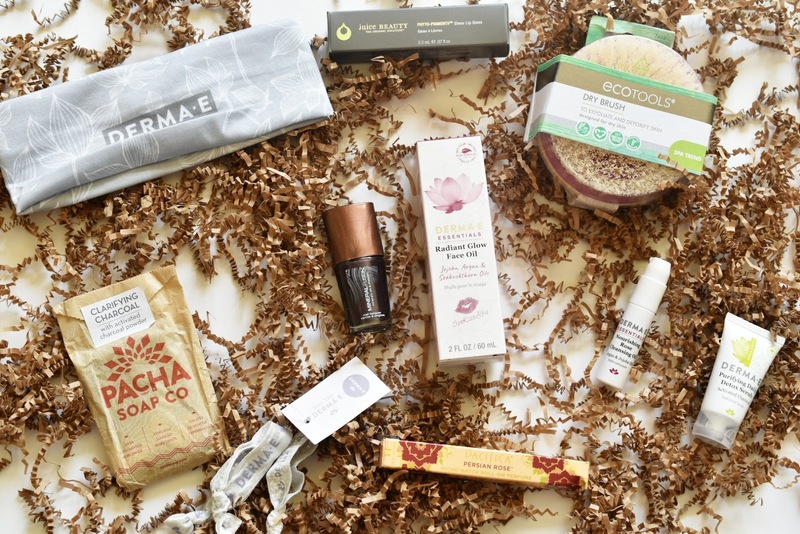 As I mentioned, DERMA-E partnered with Youtuber SunKissAlba to create the first ever Whole Foods "Favorites" Box. All proceeds from this box will be donated to SunKissAlba's favorite organization, the Special Olympics. Eco Tools Dry Body Brush @EcoTools- Enjoy an at-home spa treatment using this Eco Tools Dry Body Brush (with cruelty-free synthetic bristles) for beauty you can feel good about. DERMA-E Purifying Scrub @DERMAE- Gentle enough for daily use, this detox scrub lifts away micro-pollutants and impurities while promoting oxygenation for a fresh, healthy radiance. Juice Beauty Lip Gloss @JuiceBeauty- Beautiful lip color saturated with plant-derived Phyto-Pigments instead of artificial dyes, offering a beautiful variety of finishes and levels of coverage. Pacha Clarifying Charcoal Bar Soap @PachaSoap- Activated charcoal powder is known to detoxify and cleanse naturally. Pacha's Clarifying Charcoal bar is loaded with charcoal powder and is great for oily skin. Pacifica Perfume @ILovePacfica- Smell amazing with this 100% vegan and cruelty-free roll-on perfume. The compact roll-on design also makes this a perfect travel companion. DERMA-E Rose Cleansing Oil @DERMAE- This rinse-free cleansing oil leaves your skin feeling superbly moisturized, along with an improved soft and dewy appearance. Mineral Fusion Nail Polish @MineralFusion- Polish created with an antioxidant rich, 100% vegan formula. This chip-resistant lacquer provides flawless color free of harsh chemicals. EXTRAS- DERMA-E super soft yoga headband and zero-pull hair ties to keep hair out of the way as you beautify yourself. When you think of the store Whole Foods, your first thoughts are geared more towards healthy, real organic foods. 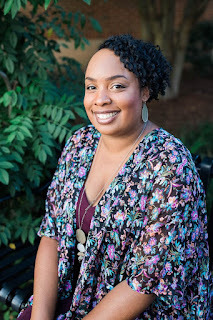 But, Whole Foods is more than just that, they also sell natural skincare products too, so this whole partnership between DERMA-E, SunKissAlba, and Wholefoods mesh well. I can't wait to dive in and try all of my new beauty goodies, already I started using the nail polish and amazed at how beautifully bold the nail color is. It's a rich dark purple that hues kind of look close to being a black color. I need to hide this polish because already Lauren is trying to keep it for herself! Disclosure: I was given these products to share with you all! All opinions are my own. Post contains affiliate links. Which product(s) would you like to try out? This looks like a great box. I have a few of the Mineral Fusion nail polishes that I purchased on clearance from Whole Foods. I would love to try the charcoal soap. I love love that brand too. That box looks awesome girly. Enjoy! Ooh, you got some goodies! I love getting boxes like this. I'm going to have to check this out for next time. This entire box is full of goodies. I want to try everything.